This hot European destination is one of the major countries in the world where sending flowers is a tradition that cannot be ignored. Flower gifting is a flourishing business here. The Czechs like to unwrap their gifts in its proper way. Most popular flowers here for gifting are Red & White Roses, Carnations, Gerberas & Lilies. Chrysanthemums are funeral flowers in Czech Republic. Flowers are also used on a big way as business gifting. Send flowers same day to Czech Republic using our local florists & flower shops. Order by 12 noon. Send Easter Flower Arrangement, Easter Hampers & Gift Baskets to Czech Republic. Send Roses, Carnations, Lilies throughout Czech Republic for occasions like Birthdays, Anniversaries, Funerals, etc. Enjoy affordable flower delivery across Prague, Ostrava, Brno, Liberec & nationwide delivery. How do i send International Flower Delivery to Czech Republic? 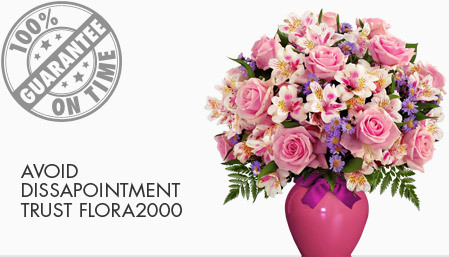 Flora2000 has transformed International flower delivery to Czech Republic into a fine and effortless art. With our efficient flowers & gifs delivery services worldwide; you are sure to find the perfect expression of your message to your loved ones. Be it Roses, Lilies, Carnations or Cakes, our gifts are sure to make both the sender and the receiver happy. We make sure the gifts you give reflects what you feel about the receiver. It’s a hot European destination which comes under one of the safest place in the world. This country is well known for its amazing art work & foreign visitors. People of this country are polite, friendly and a bit conservative. Czech people like to unwrap the gift in its proper way. They prefer small gifts costing between $16 to $30. Red & White Roses, Carnations, Gerberas are some of the most popular flowers for gifting. Chrysanthemums are funeral flowers in Czech Republic. If you are planning for business gifting Lighters, calculators and pens are apt choices. We have an exclusive collection of flower arrangements, hampers & baskets for this Easter. Our classy collection of flowers & Gifts for Easter to Czech republic.